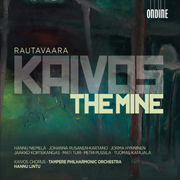 Kaivos (2009) by Einojuhani Rautavaara has been nominated for a GRAMMY Award in the category of Best Opera Recording (ODE 1174-2). The winners of the 54th GRAMMY Awards will be announced in a ceremony held by the National Academy of Recording Arts & Sciences on February 12, 2012, at the Staples Center in Los Angeles. Einojuhani Rautavaara wrote this, his first opera, during the years 1975-58 and 1960, and still considers it to be "perhaps the best opera I have ever written." The work in three acts tells the story of an uprising by mine workers somewhere in Europe at the end of the 1950s. Its underlying thematic allusions to the Hungarian uprising of 1956 impeded a staged production and live performance in Finland, a neighboring country of the then-Soviet Union. The music was eventually given its live première in a concert performance on September 24, 2010, at the Tampere Hall in Finland, and subsequently recorded for CD. The recording was released by Ondine in Spring 2011 to international critical acclaim. It features the same forces as the premiere performance: Hannu Lintu conducts the Tampere Philharmonic Orchestra, the specially assembled Kaivos Choir, and a cast of leading Finnish soloists (Johanna Rusanen-Kartano, Hannu Niemelä, Jorma Hynninen, Mati Turi, Jaakko Kortekangas, Tuomas Katajala, and Petri Pussila). Einojuhani Rautavaara is one of the internationally most successful Finnish composers after Jean Sibelius. Click here for more information on the nominated CD. For more information on the 2011 GRAMMY Nominees, visit the website of the 54th Annual GRAMMY Awards.